10/11/18 – Tia has found a home! 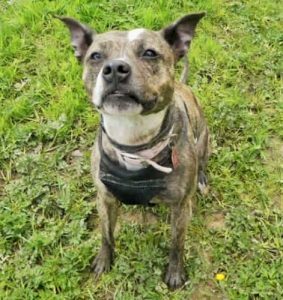 Dear, sweet Tia is an 8 year old Staffy girl in the care of RSPCA South Godstone Animal Centre in Surrey. She loves all humans, including little ones. She’s a bouncy, excitable girl and therefore had better live with children from age 12. She wants a home where someone is around most of the time, as she had a troubled early life. Poor little Tia spent her early years sad and lonely, shut away in a bathroom. She finds kennel life really stressful and would much rather be out enjoying long walks and learning some new tricks. 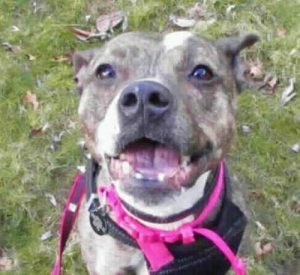 Due to her social isolation in her early years, Tia needs further work around other dogs. This is something that will take time and patience with an understanding owner to help her. She’ll need to be walked at quiet areas or times of day while she still has this fear problem. She loves having a secure field (with no other dogs) that she can run around in! Tia wants an active lifestyle with plenty of gallivanting and grass to roll in! As you can see, she has a happy nature and will thrive in the right home, with lots of love and fun. In kennels, she chews things to relieve stress so her adopter needs to be practical about this while she settles in. Tia is spayed. She had a mammary tumour removed, which was benign but the vet advised monitoring the area. She has some missing teeth, bless her! 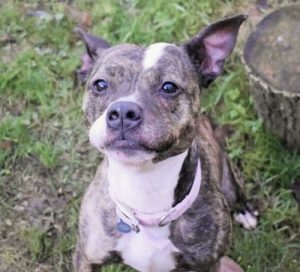 Can you give Tia the happy life she deserves? Please mention that you saw Tia on the Oldies Club website.